Example code for this post can be found on GitHub. Visual Studio Code on Mac OS X is awesome. In fact, Visual Studio Code is awesome period. I have been using Brackets on OS X for a while now as a free alternative to Sublime. Brackets is good, but I am a Visual Studio junkie in Windows and having Visual Studio in OS X to do front end (angular) and back end (C# / web api) development is just awesome. 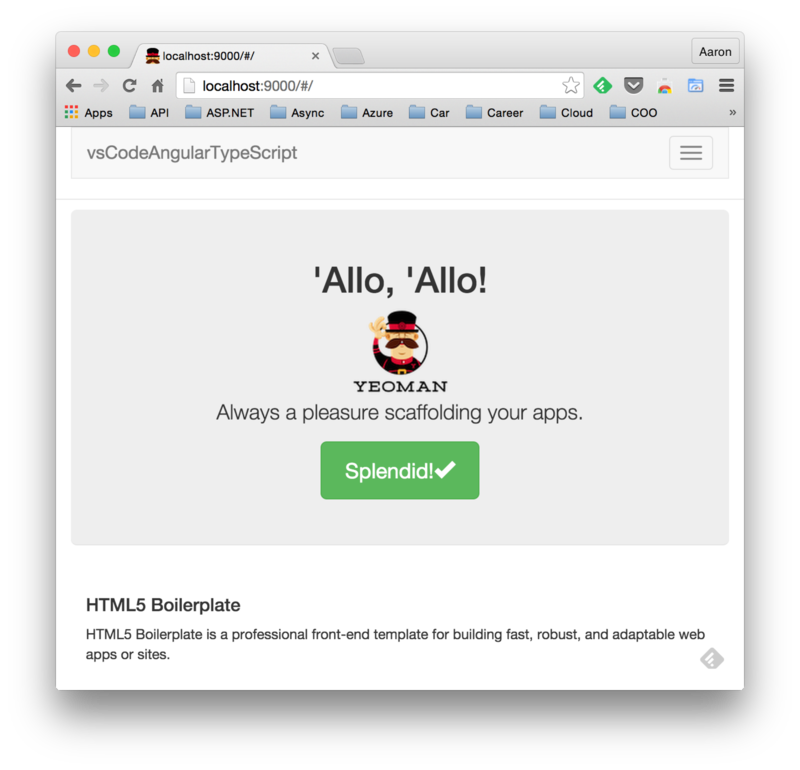 To get started with Visual Studio Code on my Mac, I decided to create a new project (Angular, TypeScript, Bootstrap) scaffolded by Yeoman. I want to use Angular as the base front end framework, use TypeScript for all of the front end code, use Bootstrap for responsive rendering and use John Papa's style guide for Angular structure. I figured a lot of people are going to go down the same path, so I might as well share the recipe. Download and install nodejs Lightweight web server that includes npm, which we will use a lot. Download and install mono Cross platform .NET framework, not really a pre-req for pure front end work, but you will need this if you open a Visual Studio project in Visual Studio Code on Mac OS X. We will use Node Package Manager (npm) to download and install all of the required packages that will give us a rich front end development environment where we can write code, buid and test with ease. The npm -g option installs packages globally. You only want to use this option for packages that you want to be available across your operating system. This should build the scaffolded angular project, launch a new nodejs server and serve up index.html If you get errors as this point, see what you missed in the previous steps and fix them before proceeding further. Now let's setup TypeScript and TypeScript intellisense for our new project. The /typings folder contains all of the TypeScript definition files that will be used to generated Intellisense. The /typings folder also contains tsd.d.ts which is a super helpful file that contains references to all other tsd files so you only have to reference a single tsd in your TypeScript files to get Intellisense for all libraries. This will run all of the grunt build tasks. If you have any errors, address them before moving on. The basics are in place, so create a new typescript file. Let’s replace app.js with typescript. For best practice, let’s split up core dependencies, app dependencies and app config into three different file. Now go to File - Open… and open the project directory you created in previous steps. 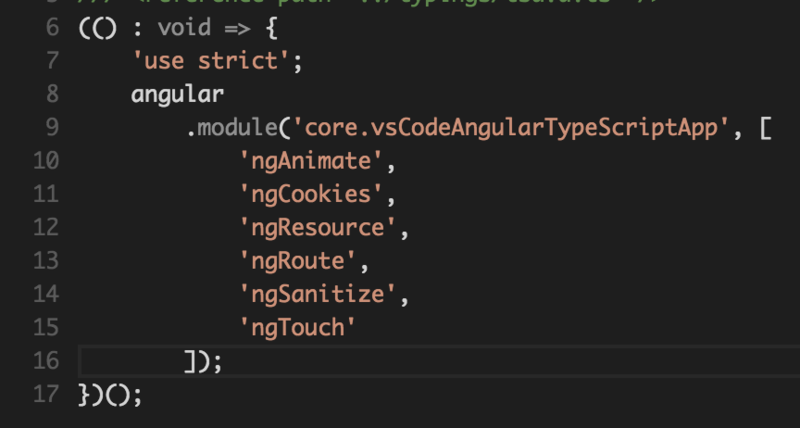 Now let’s split out angular app module definition and angular dependency injection into app.core.ts. First off, add a reference at the top of the file to tsd.d.ts so we get intellisense for angular and jquery. Then delcare an IIFE (closure) using TypeScript. Explicitly set the return type to void for best type practice. 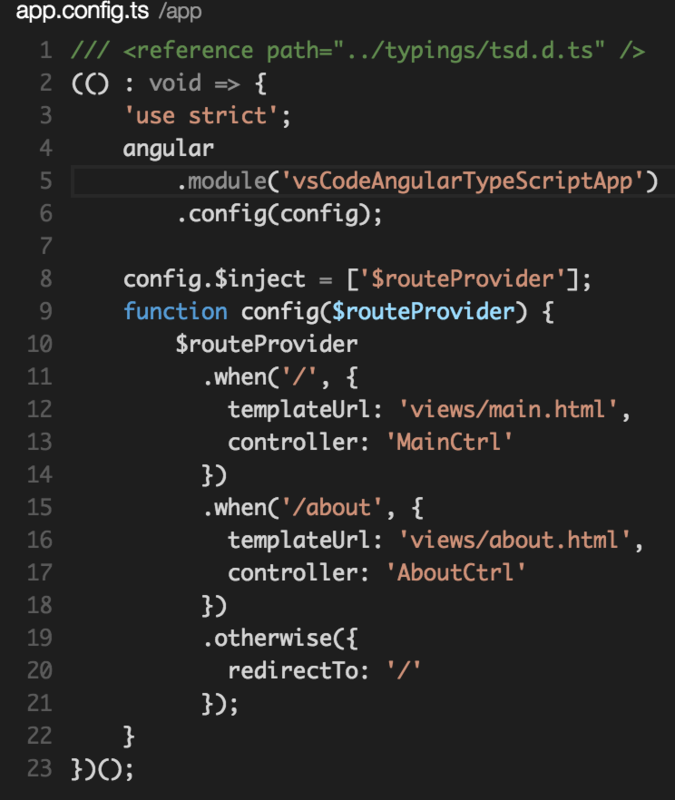 Now add the angular module instantiation and all of the angular dependencies from app.js. 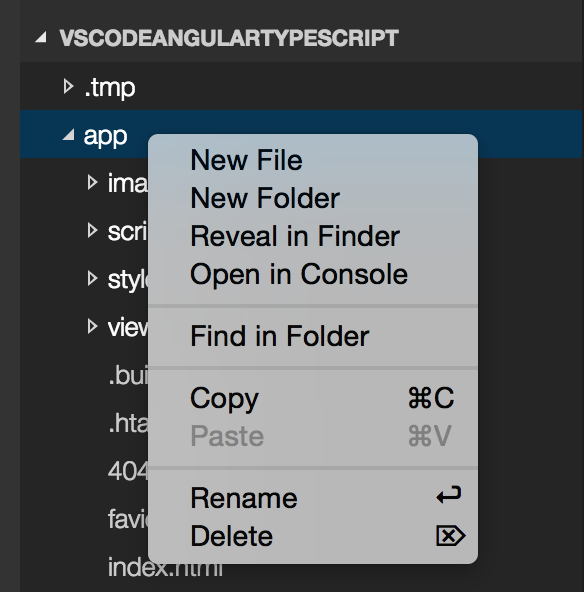 Create another new TypeScript file called app.module.ts. 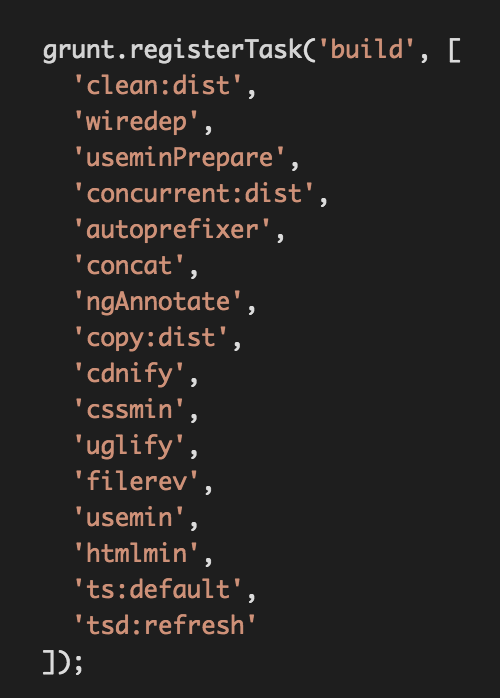 This file will contain our app instantiation and add our core module as a dependency, so we end up with a clean module file and still get all of the core angular dependencies injected. And finally create app.config.ts and put all of the app config code in there. Beauty. Now we setup our grunt TypeScript tasks to cleanup definitions if need be and transpile our ts into js. 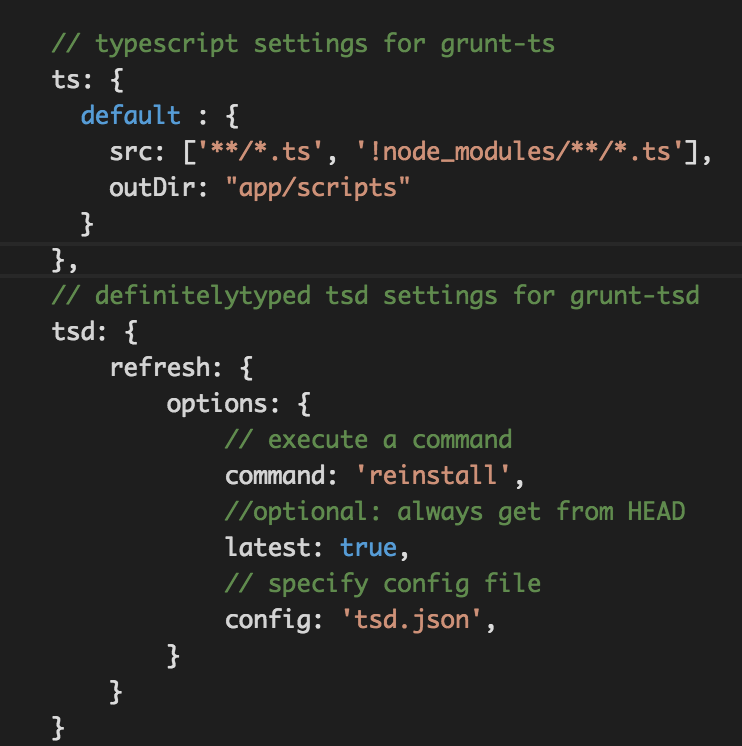 We need to edit our Gruntfile.js to include config, execution and definition of grunt-ts and grunt-tsd. This will create .js and .map files in your app/scripts directory for the .ts files we created. The site should launch in your browser again and everything should still work. 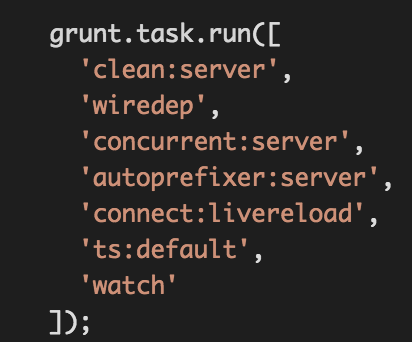 Grunt will monitor for file changes as you develop and transpile your TypeScript files into js as you save them. I used a great blog post by James McCormack as the base for uploading images with Uploadify and ASP.NET MVC. Basically Uploadify is doing the heavy lifting and I just tied the onComplete event to an ASP.NET MVC Controller method. The image is assigned in id, which is used as the Cache key and is returned back out via json. Once the call is successfully completed an img src attribute is updated to point to a ASHX image handler I wrote that accepts the id as a querystring parameter. The image handler grabs the image out of the cache and then displays it. Once the image has been uploaded, jCrop is initialized to allow for image crop selection. If the user selects a region to crop and clicks the crop button a jQuery AJAX call is made to the server. The x, y and width, height crop values are posted to the server and then the server crops the image as specified. A new modified image id is returned via json to the view and then the new cropped image is displayed via the image handler ashx once again. Resizing images follows the same basic pattern. I have hard coded the new image dimensions in the example, but you could easily add a couple of inputs to the view and allow the user to specify the new dimensions. I put together a full working example that includes all of the code above and is the basis for what I will end up implemented in my SaaS. I hope you find this helpful. I started using the new Windows Azure 1.3 SDK (BETA) yesterday and after I installed it I began getting a strange error when I tried to run Debug from Visual Studio 2010. Message=The communication object, System.ServiceModel.Channels.ServiceChannel, cannot be used for communication because it is in the Faulted state. Secondarily.... Make sure that any declarations are moved to . This was a minor issue causing a few hiccups (not the main problem), but I thought it was worth mentioning. The following book is the best reference I have found when working with jQuery. I highly recommend it! Input validation is one of those areas that most developers view as a necessary evil. We know that it is necessary and we really do want to ensure that we get good input from our users. But most of us are lazy (me included) and input validation is one of those things that gets done but usually is a quick and dirty implementation. This is partly due to laziness and partly do to input validation being painful. Thanks to the amazing jQuery Validity plug in, input validation can be really slick, easy and robust enough to work any any scenario. I specifically like the Validity plugin because it supports jQuery AJAX input validation. Other input validation implementations that I have worked with require a form post to take place. However, if you are using jQuery.ajax methods then there isn’t a form and you need to validate the formless input. The jQuery Validity code is extremely straight forward and minimal. Here is a little ASP.NET MVC demo that I threw together using jQuery Validity so you can see it in action and play with it. I love Windows Live Writer as a blogging application and use it pretty much exclusively for writing my blog posts. The only downside is that I have found it difficult to get code snippets formatted correctly in my posts. Luckily a friend of mine, Tyson Swing, turned me on to a great code snippet plugin for Windows Live writer. The following books are the best references I have found when working with jQuery and ASP.NET MVC. I highly recommend both. Kind of an ironic statement isn’t it? We obviously want to avoid errors if at all possible in our applications, but when errors do occur then we want to provide some nice feedback to our users. The worst thing that can happen is to blow up a huge server exception page when something goes wrong or equally bad is not providing any feedback at all and leaving the user in the dark. Although I do not recommend displaying actual .NET Framework exception messages or stack traces to the user in most instances; they are usually not helpful to the user and can be a security concern. Using the jQuery Ajax methods ($.ajax(), $.get(), $.post(), etc.) to call your controller (in ASP.NET MVC) or web service (in ASP.NET) to perform server side actions (GET, POST, etc.) is a great way to provide a great user experience in ASP.NET applications while also interacting with a server to get or update data. However, if an error occurs on the server, or an exception takes place in the server side methods, then the problem can often be hidden from the user. Because a Postback is not taking place, if you do not handle errors on the jQuery Ajax methods and display some feedback then the user will be left in a state where they have no idea that a problem has occurred. Luckily, we can use the error callback on the jQuery Ajax methods along with some controller information to display some nice error feedback to the user. I have defined an Entities assembly that contains an object to be used to provide operation feedback between assemblies and methods. My persistence and logic methods pass an OperationResult as a return type. I have created a controller method that calls the logic layer. Notice that if the OperationResult.Success property is set to false, I throw an exception in the controller method. The catch block handles that exception and sets the Response.StatusCode to an error and then also does a Response.Write of the error message. This is how we communicate with the jQuery error callback that there was an error on the server side. In the view I simply have two hidden labels that I show or hide depending on whether or not the jQuery.ajax call was successful. I populate the error label with the custom error message from the server in the jQuery.ajax error callback if a problem occurred on the server side. This provides a nice way to give feedback to the user when problems occur on the server side and also establishes a nice error handling pattern within your projects. I put together a working demo with full source code that you can download below. Here are the best jQuery libraries, plug-ins and controls that I have found to date. Excellent user interface controls, interactions and effects that are built on top of the jQuery framework. Provides themes for customized look and feel and out of the box excellent user experience. Sweet library that makes working with dates on the client side infinitely easier. Great for date calculations, date ranges and date validation. The jQuery Validity plug-in is an extremely flexible, lightweight and easy to use validation library. You can validate anything on the fly in any instance. It doesn’t require a form or anything else, just setup the validation rules (there are a bunch of common validations built in) and go. The DateRangePicker plug-in from the Filament Group is an awesome little user experience element that makes selecting dates so much nicer. You can select predefined dates or date ranges easily (such as last week, last month, yesterday, etc.) and is the best user experience have seen selecting a date range. jQuery Tools is an excellent library of user interface elements. It is fairly lightweight and can add some very nice user experience elements to your applications.